Properties in Mariposa Grove average 4.6 out of 5 stars. Property 2: Wildflowers and waterfalls abound! Lovers’ Cabin; Gateway to Yosemite National Park and more! Property 4: Lovers’ Cabin; Gateway to Yosemite National Park and more! 1893 vineyard cottage at the gateway to Yosemite. Property 5: 1893 vineyard cottage at the gateway to Yosemite. Luxury Yosemite Log Cabin ~ 2 Miles to Yosemite Entrance~ Now Booking!! Property 7: Luxury Yosemite Log Cabin ~ 2 Miles to Yosemite Entrance~ Now Booking!! The Herrera Hideaway: a Shaver Lake cabin! Adventure begins here! Property 9: The Herrera Hideaway: a Shaver Lake cabin! Adventure begins here! Charming Mountain Chalet with Modern Conveniences in the Heart of Shaver + WIFI! Property 11: Charming Mountain Chalet with Modern Conveniences in the Heart of Shaver + WIFI! "Yosemite's Suite Retreat" Gingerbread Tiny House Perfect for 2! Property 12: "Yosemite's Suite Retreat" Gingerbread Tiny House Perfect for 2! Cozy Cottage close to Yosemite, Beautiful Views, Hot Tub & More! Property 16: Cozy Cottage close to Yosemite, Beautiful Views, Hot Tub & More! Property 17: Sweet family home w/ spacious deck - right in the village, walk to the lake! A classic forest cabin with modern amenities - the best of both worlds! Property 20: A classic forest cabin with modern amenities - the best of both worlds! Peaceful Yosemite Pines Retreat, HUGE YARD, POOL, SPA, PLAY AREA and PONIES! Property 21: Peaceful Yosemite Pines Retreat, HUGE YARD, POOL, SPA, PLAY AREA and PONIES! YOSEMITE Sugar Pine Cabin, 7 Miles To The South Entrance Of The Park. Property 22: YOSEMITE Sugar Pine Cabin, 7 Miles To The South Entrance Of The Park. Property 25: Cozy cabin for two with furnished patio - close to the village and the lake! Yosemite vacation rental 30 minutes from Yosemite Valley's main gate. Property 26: Yosemite vacation rental 30 minutes from Yosemite Valley's main gate. Cozy, Clean Cabin Near Shaver Lake - Prime Location! 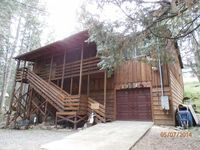 Property 28: Cozy, Clean Cabin Near Shaver Lake - Prime Location! YOSEMITE CABIN IN HISTORIC SUGAR PINE -7 miles to Yosemite So. Entrance HOT TUB! Property 33: YOSEMITE CABIN IN HISTORIC SUGAR PINE -7 miles to Yosemite So. Entrance HOT TUB! 'Yosemite's Suite Retreat' Little Bear Tiny House. Studio Perfect For 2! Property 38: 'Yosemite's Suite Retreat' Little Bear Tiny House. Studio Perfect For 2! Rustic A-frame cabin with spacious deck and great location! Property 39: Rustic A-frame cabin with spacious deck and great location! Chipmunk Hollow - Get Your Nature On! Property 40: Chipmunk Hollow - Get Your Nature On! This quaint cottage is the perfect home base for your Yosemite trip. Property 43: This quaint cottage is the perfect home base for your Yosemite trip. Fire Escape Cabin-Fun Fire Department Theme ! 12 miles to Yosemite gate! Property 45: Fire Escape Cabin-Fun Fire Department Theme ! 12 miles to Yosemite gate! Property 48: Charming Cabin at Beautiful Bass Lake. 10 miles to Yosemite ~ Milliaty SAVE10% of room rate! 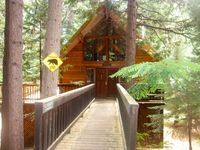 Property 50: 10 miles to Yosemite ~ Milliaty SAVE10% of room rate! We had such a lovely time at the cabin. It was perfect for our family which included our dogs. How wonderful that Bella and Quincy were welcome at the cabin and able to go on their first family vacation. We turned off the phones and turned on nature. We played games, hiked, visited Yosemite and Bass Lake and had a great dinner in Oakhurst at South Gate Brewing. I started and finished a book which I haven&rsquo;t done in over 5 years. Even walking the dogs and picking up the daily Poops was fun. The dogs got spoiled going on so many walks. Thank you Ken and Ronna for your generosity and for helping to give us a fantastic week!!! Wendy and Robert. We had a smooth stay. The property was clean and comfortable. Everything we needed was provided, although we didn&rsquo;t always know exactly where it was, but in those cases we got quick responses when asking. Our host was helpful and prompt.